For turkey hunters chomping at the bit to hit the springtime woods for some hard-core gobbler getting action, what's there to do in the weeks remaining before the law comes off another season of longbeard action? Simple. Work on fine-tuning the best shotshell-pellet pattern and performance possible from the shotgun and choke combination to be utilized, giving a careful look to one or more of these five premium turkey hunting loads listed below. After a couple of years out on the market, the five-shell boxes of Federal Premium 3rd Degree Turkey Loads continue to be one of the hunting industry's best overall options for quickly dispatching a springtime gobbler. Using multi-shot, three-stage payloads, the 3rd Degree load delivers deadly performance at extended ranges while still offering large, forgiving patterns at closer distances when a longbeard slips in and surprises a hunter. With a mixture of 40-percent #5 premium copper-plated lead, 20-percent #6 FLITESTOPPER lead and 40-percent #7 HEAVYWEIGHT lead – not to mention the FLITECONTROL wad, which opens up from the rear and stays with the shot column longer than conventional wads do – the result is a virtual bombproof 12-gauge or 20-gauge spring turkey load that patterns and performs well at both short and long ranges. After the highly successful first-year of the ground-breaking Winchester Long Beard XR in 12-gauge, the folks at Winchester Ammunition brought the 20-gauge version of this shell out at the 2017 SHOT Show. Based on the same long-range Shot-Lok Technology that delivers a long-range, hard-hitting payload in the 12-gauge shell, the 20-gauge version uses the same liquid resin that hardens and keeps pellets in place until the round is fired. When the shotgun trigger is pulled, the resin fractures into a micro-buffer that keeps the shot from deforming, allowing pellets to exit the barrel in perfect round shape, giving tighter and more uniform patterns down range at extended distances. 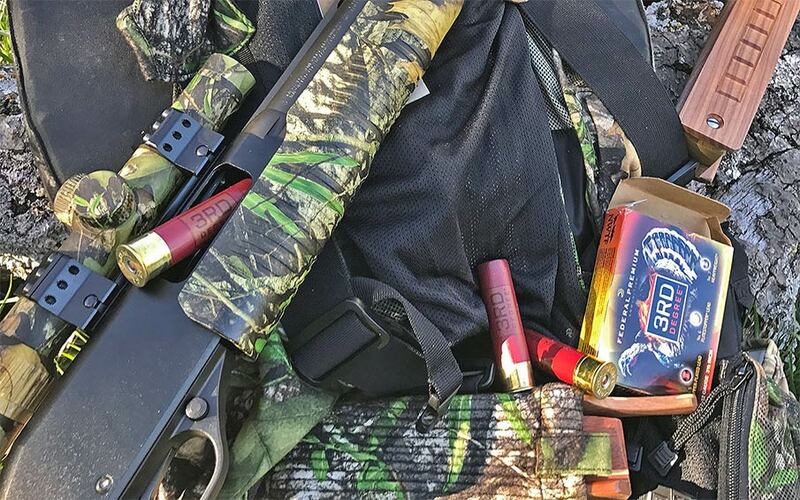 The new 20-gauge version of the Long Beard XR comes in 10-round boxes that feature 3-inch shotshells loaded up with either #5 or #6 shot sizes. After Browning debuted its shotgun ammunition line in 2016, the company is bringing out a new gobbler-getting load with the unveiling of the Browning BXD Turkey Load. After being shown to the media at the 2017 SHOT Show, this longbeard hammering load features nickel-plated and buffered shot loaded into a tight-patterning wad. The result is a hard-hitting, deep penetrating and high performance shot shell that comes in 10-round boxes. As it hits the shelves, expect to find it in both 20- and 12-gauge configurations. For a number of years, the folks at HEVI-SHOT have helped to set the benchmark for producing non-toxic loads for a variety of game birds and game animals. That includes spring turkey loads with the company's HEVI-13 load and the HEVI-SHOT Magnum Blend load. More recently, the Oregon-based company has ventured away from its tungsten shot roots just a little bit by offering the HEVI-SHOT Triple Beard Lead Shot turkey load. Using the company's Speed Ball Technology, this springtime gobbler-getting load works to keep deformation at bay by nipping the pancake effect in the bud. The all-lead turkey shotshell is offered in a number of configurations in both 20- and 12-gauge. While it might seem a bit difficult to improve on the company's Premier Magnum Load - or even the Nitro Turkey load, but that's what the folks at Remington have done with the Remington Premier High Velocity Magnum Copper-Plated Turkey Load. Like other loads mentioned above, this one isn't brand-spanking new, but that hardly matters when you slide two or three of these high-performance shells into your turkey gun. Utilizing the company's Power Piston one-piece wad, hunters can choose between a number of different configurations in 12-gauge. And there you have it. With some of the best technology and in-the-woods performance of all-time in the shotgun ammunition industry, these spring turkey loads are about as good as any have ever been. So why not give one or two, or even all five, a try on the practice range? Because when you do, you'll discover one that's just right for your shotgun-and-choke combination.